Our expert polishers provide quality stainless finishes, with minimal lead times! 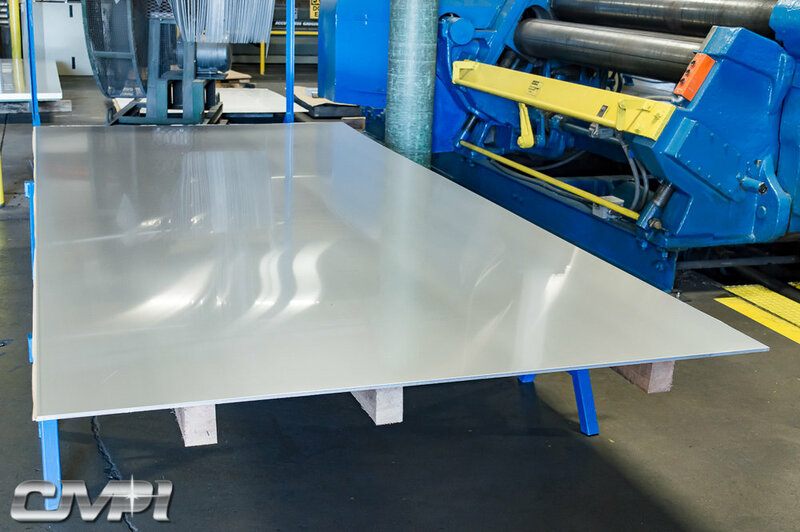 CMPI was born to offer plate and sheet polishing services to other manufacturers, serving both the numerous stainless steel fabricators in the local area and beyond. As CMPI has grown, the demand for our brand of plate polishing has increased dramatically. We attribute our success in the industry to our organization's rigorous quality standards. We take no shortcuts, because our mission is to help you define brilliance. With over 20 years in the sheet and plate polishing industry, CMPI is the first name you should think of when you need exceptional stainless polishing services. From 20 gauge to 3/4" thickness, one side or both, we are confident that our high grade polishing services will meet and exceed your expectations, because our standards are your exact specifications. CMPI Standard Polish is with hold-downs, there is a 3/8" to 1/2" maximum on one end and 1 3/4" to 3" maximum on the other end left unpolished. CMPI Tab Polish provides polishing to approximately 3/8" (+/- 1/4") on each end with some possible distortion from weld on tabs. Available in thicknesses 14 gauge and thicker. CMPI Full Sheet/Plate Polish requires material at least 3" longer than actual required finished length. This is accomplished by polishing longer material and shearing off approximately 3" from the overall length (determined after polishing). All applicable materials we provide have MTR's on file. As necessary, our materials and workmanship are in compliance with ASME and AWS guidelines. We can procure, fabricate and polish material to your exact specifications. Our volume purchasing capabilities help us lock-in the best pricing possible for our clients. Carbon-free handling equipment for manipulating material. Disclaimer: CMPI polishing of customer supplied fabrications described on this page does not remove a uniform amount of base material. All described materials could have thinning of the material from the polishing process. Therefore, CMPI does not imply nor accept customer required minimum thickness/dimensional requirements unless approved in writing at time of order. Our standards are your specifications. There's a reason that CMPI has developed strong partnerships in so many industries. Our stainless polishing and fabrications are utilized by mixer tank and pressure vessel shops, industrial pharmaceutical companies, and high end architectural contractors around the nation, and that's just naming a few. Get in touch, and let us help you build something brilliant .